George Heath was born in the village of Gratton in the Staffordshire Moorlands in 1844. Educated at the village school, he worked on his father’s farm, then was apprenticed to a builder. While working on the church in the neighbouring village of Horton, he caught a chill which developed into consumption and he died five years later at the age of 25. He was also a poet. 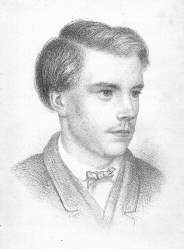 During his brief lifetime he achieved little more than local fame as ‘the Moorland Poet’ and ‘the Invalid Poet’. He published two slim volumes of verse but after his death his friends produced an edition of his poems and also arranged for a memorial stone to be erected over his grave in Horton churchyard. Death and the frustration of unfulfilled ambition are the two major themes of his poetry, and the epitaph on his gravestone (quoted above) reveals his own belief that his work would be forgotten. Hopefully he will be proved wrong.